Relying on the similarity between Sumerian & Dravidian ethinic type,scholars argue that the dravidians invaded India from western Asia through Baluchistan.Due importance should be attached to the fact that the speech of a Baluchi tribe,is Brahui,which bears close resemblance to the modern Dravidian language. 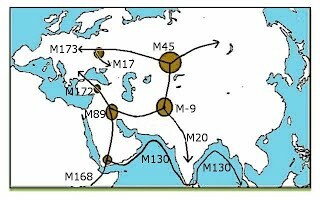 From the Journey of Man of Spencer Wells,We find that the a race,higher in culture ,ancestors of the Indian clan,M20 the marker of the speakers of Dravidian languages in India,who belong to Haplogroup L,gradually made its way from the north or north-west ,probably through Baluchistan into the plain of the Indus,and thence ultimately passed down into the regions south of the Vindhya,where the four southern states lie.This race may be called the proto-dravidian.This first major wave of migration into India/southern India from the Middle East and southwestern Asia,around 30,000 years ago,would have encountered the earlier coastal migrants,bearers of the M130 genetic marker,saw Blacks with straight hair,low in culture,more or less by the physical features now known as dravidian,still living there.This early people,however,should more properly be termed pre-dravidian.This proto-dravidians mixed its blood to greater or less degree with that of the earlier inhabitants,pre-dravidian. From these combinations have arisen the dravidians history.Therefore,We can safely assume that there may be some connection between saiva principles & sumerian religion.Exaltation of Inana (Inana B),written by Enhedua﻿﻿nna,the Sargon daughter during 2200 BC,We find this evidence. My lady, you are the guardian of the seven divine powers! He is for Himself the Support All." 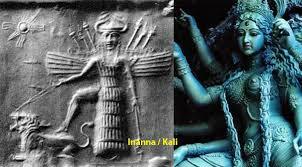 Therefore,Sumerian's Inana ,Indus valley's Great Mother goddess,and Sangam Tamil's Korravai ,may be tranformed in to goddess sakthi or siva's sakthi in Saiva Siddhanta. Also,Indus Valley seals have been found as far afield as Mesopotamia (present-day Iraq) in the cities of Umma and Ur, in Central Asia as well as close resemblance between some objects from the Indus Valley sites and those from ancient Sumeria,in Southern Iraq clearly proof the connection between sumerian & Indus valley religions & culture,hence with tamil [or dravidian] people of South India.For example,Mohenjodaro seal of grappling rampant tigers.This motif is found on seals in Mesopotamia from story of Gilgamesh as well. Many tamil literatures shows murugan as maternal diravida god as it indicates only the relationship by the mother's side such as: "வெற்றி வெல்போர்க் கொற்றவை சிறுவ", "மலைமகள் மகனே","இழையணி சிறப்பிற் பழையோள் குழவி"There is no mention in the earlier Sangam poems of Murukan being a son of Sivan,But it says only that he is a son of Korravai.It clearly shows that sangam tamils had a society that are matriarchal. [a society in which females, especially mothers, have the central roles ],now mostly lost after the aryan inversion & we are now mostly paternal society. Also.the sangam literature like Tholkappiyam,ettuthogai,paththu paaddu ..and silappathikaram & manimekalai does not have any direct reference to word "Siva" or "saivam",There were many indirect reference to "Siva ". 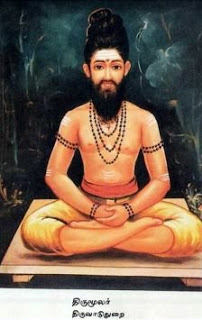 Even though we had many evidences about Siva & sakthi worship in Sumeria & Indus valley ,Well before aryans , Saiva Siddhanta, as a system of philosophy, first assumes a palpable form only in 5th century AD.Disastrously, The Sanskrit sources also contributed another element for this religion. ie the Vedas,Sanskrit puranas and epics & these were presented to the Tamil people as Tamil religions This was made possible by religious synchronism. But, remember, “Hinduism” is the latest name for the post-Vedic religion Brahmanism[Vedism],the religion of the ancient Indo-European-speaking peoples who entered India about 2000 BC from the region of present-day Iran.When Vedic religion gradually evolved into Hinduism between the 6th and 2nd centuries BC, the texts, taken collectively, became the most sacred literature of Hinduism,and this Vedic Hinduism/"Brahminism" and its [Vedic] influence also seen in Tolkappiyam ,Purananuru and other sangam works[700 BC to 300 AD],"அறு வகைப் பட்ட பார்ப்பனப் பக்கமும்"-Tolkkappiyam 2.16 and "தந்தை தோழன் இவர் என் மகளிர் அந்தணன் புலவன் கொண்டு வந்தனனே"/"They are his [king Pari] daughters, I am their father’s friend, They are my daughters now. I am a brahmin,and a poet, brought them here," - purananuru 201 are few example. It is the varna-hierarchy. In the varna hierarchy there are two poles: one of purity and one of pollution – which makes people worthy and contemptible. This worthiness and unworthiness is distributed in the hierarchy. The top-most varna is considered the most worthy and the bottom-most the most unworthy and it is nothing to do with saivam,Thus,Shaivism is the authentic Tamilian religion, radically different from Aryan Brahmanical Hinduism.When you realise this,you will definitely understand the real meaning of thirumanthiram 81,"The Lord made me, my task assigned. In sweetest Tamil His Glory to expound"/"என்னை நன்றாக இறைவன் படைத்தனன் தன்னை நன்றாகத் தமிழ் செய்யுமாறே"!